A quark is a hypothetical elementary subatomic particle. This sculpture reminded us of the order and chaos of the atom, hence the name. 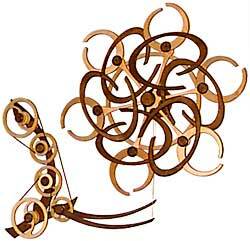 Quark Cotillion is the next generation of the motion and mechanism I first explored with my sculpture Rhapsody. I have used a series of six combination wheels to create a more complex and kaleidoscopic motion. Each of the six combination wheels stays in a nearly fixed orientation while being orbited at a changing pace about a common center. This results in a fascinating array of constantly changing kaleidoscopic patterns. The entire assembly is powered and controlled by the mechanism on the left-hand side of the sculpture. This piece runs almost silently for about 16 hours.